Other Jesus And Buddha As Brothers ! 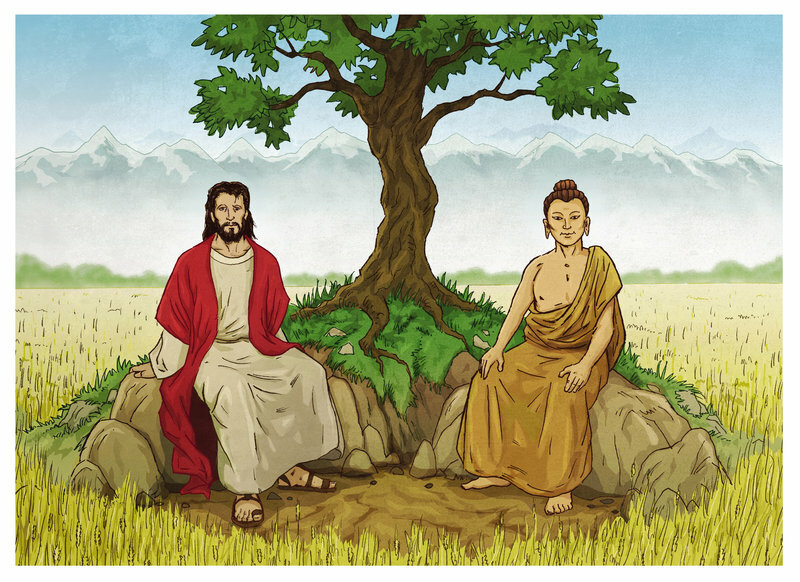 Jesus And Buddha As Brothers ! The dialogue between Buddhism and Christianity has not gone very far, in my opinion, because we have not been able to set up a solid ground for such dialogue. This is a reflection of the present situation. Buddhists believe in reincarnation, the possibility for human beings to live several lives. In Buddhist circles, we do not use the word incarnation very much: we use the word rebirth. After you die, you can be reborn and can have another life. In Christianity, your life is unique, your only chance for salvation. If you spoil it, then you will never get salvation. You have only one life. Buddhism teaches that there is non-self, anatta. Christianity clearly teaches that a Christian is a personalist. Not only are you a person, self, but God is a person, and He has a self. The Buddhist teaching of emptiness and no substance sounds like the teaching of no being. Christianity speaks of being, of existence. The teaching of St. Thomas Aquinas speaks of the philosophy of being, la philisophie de l'etre, the confirmation that the world is. There is compassion and loving-kindness in Buddhism, which many Christians believe to be different from the charity and love in Christianity. Charity has two aspects: your love directed to God, and your love directed to humankind. You have to learn how to love your enemy. Our Christian friends have a tendency to remind us that the motivation of love is different for Christians and Buddhists. There are theologians who say that Buddhists practice compassion just because they want liberation; that Buddhists don't really care about the suffering of people and other living beings; that they are only motivated by the desire to be liberated. In Christianity, your love is grounded in God. You love God, and because God said that you must love your neighbor, so you love your neighbor. Your love of your neighbor springs from the ground of your love of God. Many people, especially in Christian circles, say that there are things in common between Christianity and Buddhism. But many find that the philosophical foundations of Christianity and Buddhism are quite different. Buddhism teaches rebirth, many lives. Christianity teaches that only this one life is available to you. Buddhism teaches that there is no self, but in Christianity there is a real self. Buddhism teaches emptiness, no substance, while Christianity confirms the fact of existence. If the philosophical ground is so different, the practice of compassion and loving kindness in Buddhism and of charity and love in Christianity is different. All that seems to be a very superficial way of seeing. If we have time and if we practice our own tradition well enough and deeply enough, we will see that these issues are not real. First of all, there are many forms of Buddhism, many ways of understanding Buddhism. If you have one hundred people practicing Buddhism, you may have one hundred forms of Buddhism. The same is true in Christianity. If there are one hundred thousand people practicing Christianity, there may be one hundred thousand ways of understanding Christianity. In Plum Village, where many people from different religious backgrounds come to practice, it is not difficult to see that sometimes a Buddhist recognizes a Christian as being more Buddhist than another Buddhist. I see a Buddhist, but the way he understands Buddhism is quite different from the way I do. However, when I look at a Christian, I see that the way he understands Christianity and practices love and charity is closer to the way I practice them than this man who is called a Buddhist. The same thing is true in Christianity. From time to time, you feel that you are very far away from your Christian brother. You feel that the brother who practices in the Buddhist tradition is much closer to you as a Christian. So Buddhism is not Buddhism and Christianity is not Christianity. There are many forms of Buddhism and many ways of understanding Buddhism. There are many ways of understanding Christianity. Therefore, let us forget the idea that Christianity must be like this, and that Buddhism can only be like that. We don't want to say that Buddhism is a kind of Christianity and Christianity is a kind of Buddhism. A mango can not be an orange. I cannot accept the fact that a mango is an orange. They are two different things. Vive la difference. But when you look deeply into the mango and into the orange, you see that although they are different they are both fruits. If you analyze the mango and the orange deeply enough, you will see small elements are in both, like the sunshine, the clouds, the sugar, and the acid. If you spend time looking deeply enough, you will discover that the only difference between them lies in the degree, in the emphasis. At first you see the difference between the orange and the mango. But if you look a little deeper, you discover many things in common. In the orange you find acid and sugar which is in the mango too. Even two oranges taste different; one can be very sour and one can be very sweet.